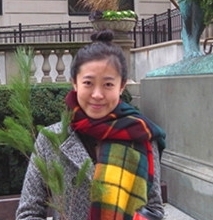 Yina Ma is an international student from Dalian, China, who started the Master’s program in neuroscience at UB in the Fall of 2011. This is her first time in the United States. She obtained her B.S. in Biotechnology at Dalian University of Technology in China. At UB, Yina is a student in the laboratory of Dr. David Shucard and Dr. Janet Shucard. Yina is interested in cognitive neuroscience, in particular working memory in a patient population with Systemic Lupus Erythematosus (SLE). Her interest in working memory is related to its relevance and importance in everyday life. Impaired working memory is a clinically relevant symptom of SLE and she is excited about examining brain activity related to this impairment in these patients. The Shucards’ laboratory uses event-related brain potentials to measure brain activity associated with working memory. Her current project is the comparison of SLE patients and controls on Event-Related Potential measures at both encoding and retrieval stages of working memory. This research will determine the specific stages of working memory that are impaired in SLE, an important consideration for therapeutic interventions.